"The Angels": Los Angeles, California; Sep 4, 1781; 9:11 am LMT; from Horoscopes of the Western Hemisphere by Marc Penfield, as rectified by Penfield; pueblo founded at present site of city of L.A. by orders of King Carlo of Spain to grow food for the King's soldiers. 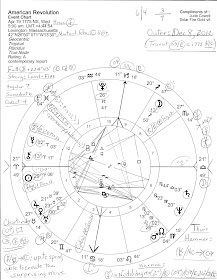 This chart is being published to show in black and white the July 21, 2009 Solar Eclipse in the 11 South Series highlighting LA's Midheaven. This is the 'systems fail; new methods are needed to deal with events brought by the Eclipse; any blocks may be violently or tragically removed' (Brady's Predictive Astrology) Series, the difficult rays under which the world now groans and labors. Unless I am mistaken, 'Sept 4, 1781' is from historical record. 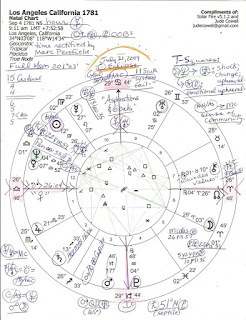 So, the fact that July 21's Solar Ecl is at Mc, the Goal/Aspiration Point of any horoscope, tells me that the financial crisis was an aspiration of the CA government. Yet if need be, I am able to accept the idea that you don't agree. 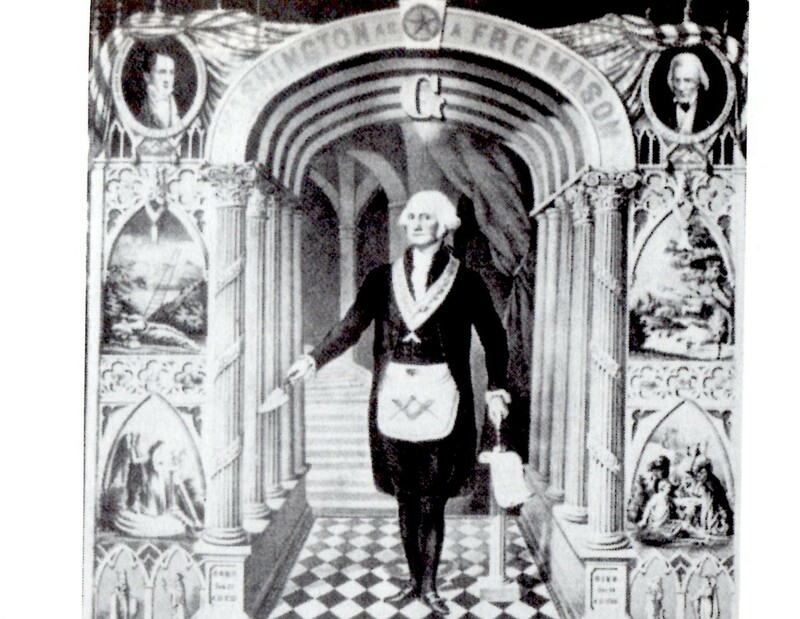 On purpose or haplessly, Californians find themselves in 2009 fending off ravenous wolves from their doors as secretly organized deals are reached and/or talking points on behalf of the New World Order are practiced for the cameras. Take your pick. The damage is being done either way, and it's been a long time coming, so if officials didn't know, they should have known. Why, it sounds like Hollywood, doesn't it? As you see highlighted in green, LA's very creative, yet possibly drunken, Moon/Neptune opposition is intensely involved with an ongoing transit from puppetmaster Pluto in early Capricorn - you see that Uranus 2Can25 in 9th house is being opposed by tr Pluto which triggers LA's natal T-Square and forms with it a Grand Cross with Pluto the fourth point, the actor as transformative catalyst. Is mighty Pluto showing his secret hand...or as I tend to think of them: secret claws...of the Dragon? Moon/Neptune = n Uranus: shock; change; upheaval; temperamental impulse. Moon/Nep = tr Pluto: emotional upheaval; high sensitivity and an inclination to be easily influenced by others. 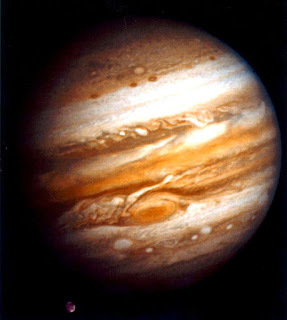 Uranus/Pluto = Moon: bringing about changes by force; daring and audaciousness; determination; ambition; restlessness. Uran/Plu = Neptune: insecurity and uncertainty; unfulfilled wishes; sympathy; a knowledge of human nature; fatigue; neuroses; deep study of a specialized subject. Well, if I had more umph I'd check out the governor's natla chart along with the recent time period that transiting North Node (NN = an associative point of encounter which has the quality of guru Jupiter) was in contact with LA's Pluto 4AQ48 Rx. But I do not, so I'll only mention that the tail of the Dragon, the South Node, swiped and is swiping LA's natal Midheaven of Public Standing and Career while its head (NN) contacted and points to the city's Ic (End of the Matter; Basis or Foundation.) Loss (SN) of career and public status (Mc.) 'Outstanding in one's field' can be another interpretation on a different level of manifestation. The Basis of this Eclipse season for CA? Pluto/NN contacts conjure the 'meetings with the powerful' smoke and mirrors that Politics thrives in...or should I say, 'lurks behind and beneath'? Plu/NN = Eclipse Sun: the urge to impose one's will on others. Plu/NN = Eclipse Moon: reaching for the big picture; making the scene emotionally; magnified ambition, or there is too much fear for any action. So if you, too, intuit that massive amounts of wealth are being transferred hence and piled up for high-handed reasons that we-the-people won't like when they're sprung upon us and our children, you're on my page, Sparkie. California budget deal punishes the poor say recent headlines, and the anaretic-degreed July 21, 2009 Solar Eclipse may be one of many culprits in bringing to public attention (Mc) California's dire financial conditions along with the waywardness of CA government officials. *any, all, or none may apply; sources: Tyl; Ebertin. So at the same time we citizens are also given approval of a new gaass chamber. I share this just so you get the correct feel for the climate here in this beloved California. Thnx, clymela. And the whole thing su*ks bigtime.